My looooove has come along. WAIT! Stop the music. Before I continue with my post, I have to right a wrong I did on my last Thankful Thursday. There probably were lots of omissions on that post because I with such generous people in my life, but the one I realized was that I didn’t include was Debbi‘s cookies, which she sent to me just because. They were so good I didn’t get a picture of them, which is why I forgot to include them. 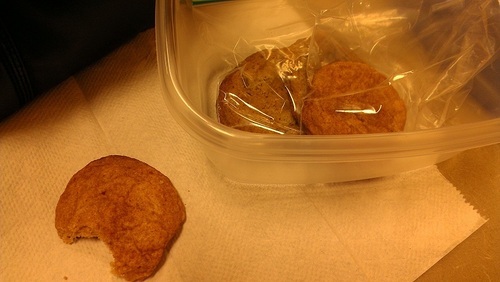 This photo, which I swiped from a friend’s Tumblr post, is the only proof her Snickerdoodles and Wookie Cookies were ever in my possession. These were the best snickerdoodles I ever had, I just loved how fat and fluffy they were. Thank you so much Debbi, you are a gem! I’m so dramatic with my title, you probably think I’ve been reconnected with a long-lost friend. Nope, just my bestest sister-friend! Danielle and I are now working together at the REC again! We both started around the same time in the spring of 2004 and she left about a year later. We were quite the pair, constantly being “shushed” when we sat together on the floor, because WE CAN’T CONTROL THE VOLUME OF OUR VOICES ! Or our laughter. And ever since that first Halloween we worked together, management has continued to remind everyone to wear “work appropriate” costumes for Halloween. Probably while visions of a certain witch and go-go girl dance in their heads. Oops. That pic was taken by a co-worker that came home with us after work for a photo shoot, so we really did, yes we did, go to work looking like that. I don’t have anything else to say except I’m so thankful to be working with my sister again! Though we live in the same city, we don’t spend much time together like we used to because we’re both so busy, and it’s nice to have some time we can chat face-to-face, even if it is on short breaks. I’ll take it! I don’t care if it’s lame, I’m giddy with excitement to be working with Danielle again. <3 Let’s see if we can stay out of trouble this time! I think you two look great in those costumes!! such fun!! I am SO happy for you! I can only imagine how thrilled I’d be too. Costumes are awesome! =) We have a lot of things in common (I’m known to be pretty loud too!=) and I think having special girlfriends in our lives is vital. I printed Debbi’s Wookie Cookie recipe. Love reading your Thankful Thursdays. A giveaway would be a great way to celebrate. I’m getting ready to do the same thing myself one day soon. I look forward to it! I loooove giveaways. hehe! What was not appropriate about those costumes? They look lovely. What wasn’t appropriate was where we wore them. LOL! If me and my twin sister worked together, that’s all we would do is laugh all day long! So happy for you V!! I think anybody would be thankful to get some of your baked treats for your 100th post. It makes me smile to know you are working with your sister, I miss mine so much as she is in PA and I am out here in AZ. I wondered if that would be something people would like. Thanks for the idea, and it’s frugal too! That sounds like a spectacular idea! awww, how fun. you two are cute! Love snickerdoodles! And your costumes are AWESOME but I can guarantee my guy wouldn’t let me out of the house in either one of them! “Too much public leg,” he would say! But if he wasn’t around, I’d totally rock an outfit like those! LOL, that’s like me, I’m a bum 99% of the time. We need help from people like you. Please! I wish I had a sister! I want that kinda bond with a sister! Oh those white boots, Danielle! Hot sistas!! !